Using the above instructions, the human readable text of the barcode does not appear in the image copied to MS Word. But, if the same procedures are followed and the image is pasted into WordPad instead, the human readable text will be visible. This problem can also be recreated when using the Windows Forms Control in any custom built application with Visual Studio .NET. This is a known issue with Microsoft® Office versions 2000, 2002, & XP but has been fixed in Microsoft Office 2003. This problem has been referenced in Microsoft Knowledge Base articles 145999 & 129658. The problem is due to a conflict with the way Microsoft Office products read metafiles created using the .NET Framework from the clipboard. When .NET transfers a Windows metafile to the clipboard, two images are actually created on the clipboard: the 32-bit enhanced Windows metafile and a 16-bit Windows metafile. The Microsoft Office version containing the product pulls the 16-bit version of the metafile from the clipboard and converts it into a specific format for pasting the metafile object into an Office application. The problem is the 16-bit metafile does not recognize the rotate transform method used to rotate the human readable text, therefore; the text is not rotated or displayed. 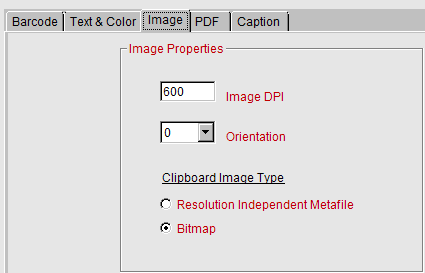 Because of this issue, bitmap is the default selection in the Image Generator for version 2009 and greater. Copy the bitmap version of the image provided by the Windows Forms Control or Image Generator to the clipboard. Upgrade to Office 2003 or later.